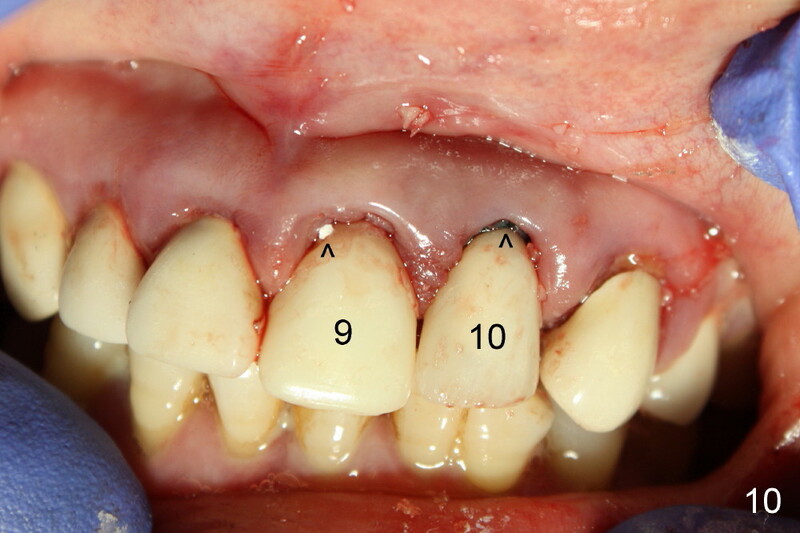 The upper left central incisor is extruded (Fig.1,4: #9), while the lateral has endo-perio disease (Fig.1-5: #10). 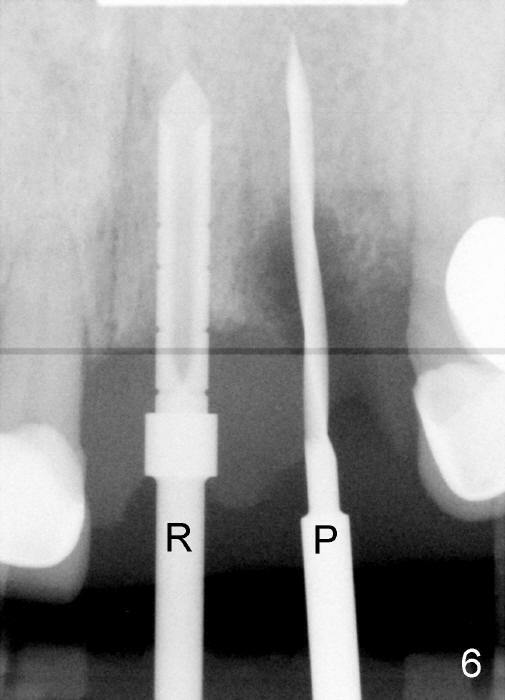 The central is extracted first, the socket debrided and soaked with Clindamycin gauze (Fig.3); osteotomy is initiated with 2 mm pilot drill (Fig.5) and enlarged with 2.5 mm reamer (Fig.6); a 3.8x12 mm submerged tapered implant is placed (Fig.7); 3.9 mm 15 º angled abutment (Torx B type) is placed (Fig.8,9). 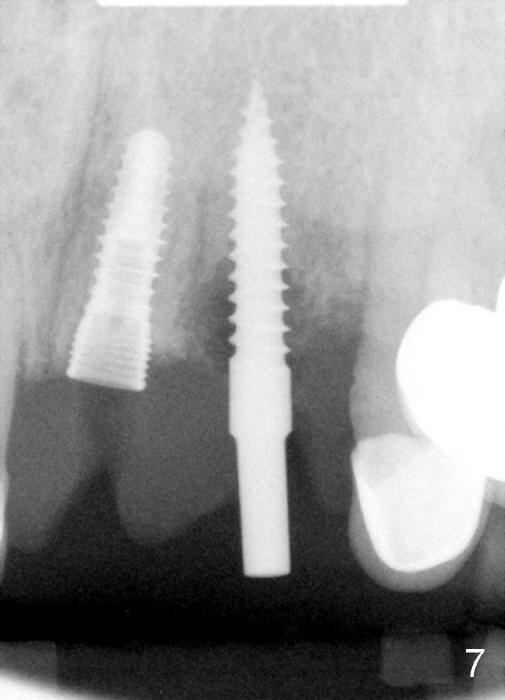 The lateral is replaced by a 3x17 mm one piece implant (15 º angled ) (Fig.6-9) due to narrow buccolingual width. 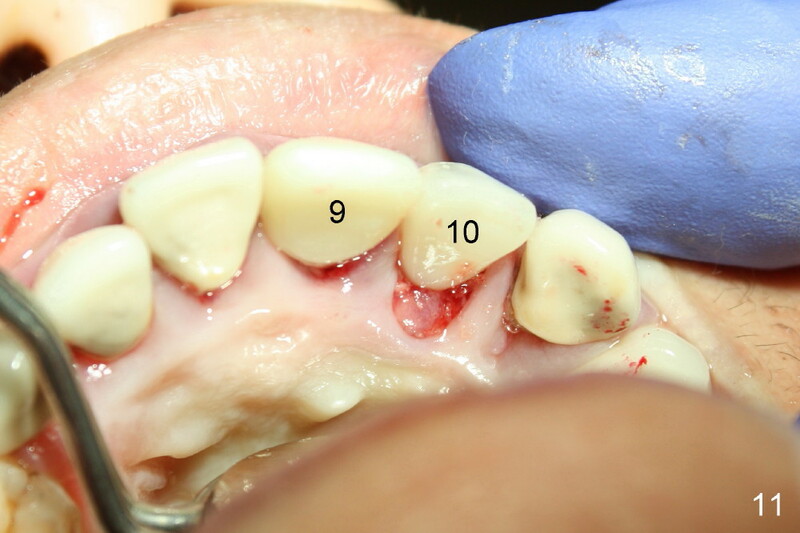 Following abutment preparation, bone graft (autogenous and allogenic) is placed around the implants (mainly at the site of #10) and #2 gingival cords are placed (Fig.7,8) before immediate provisionals are cemented (Fig.10,11). 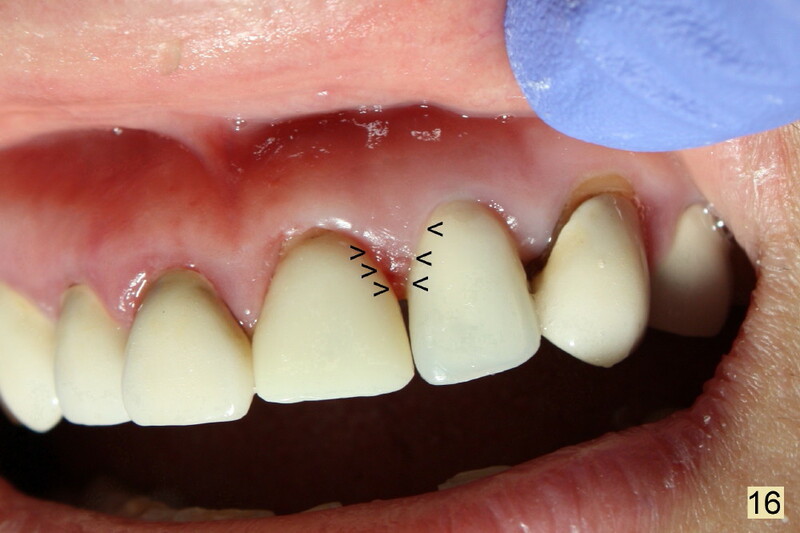 Prior to treatment, the anterior papillae are erythematous and edematous (Fig.1,2) and not supported by the displaced lateral (Fig.3). 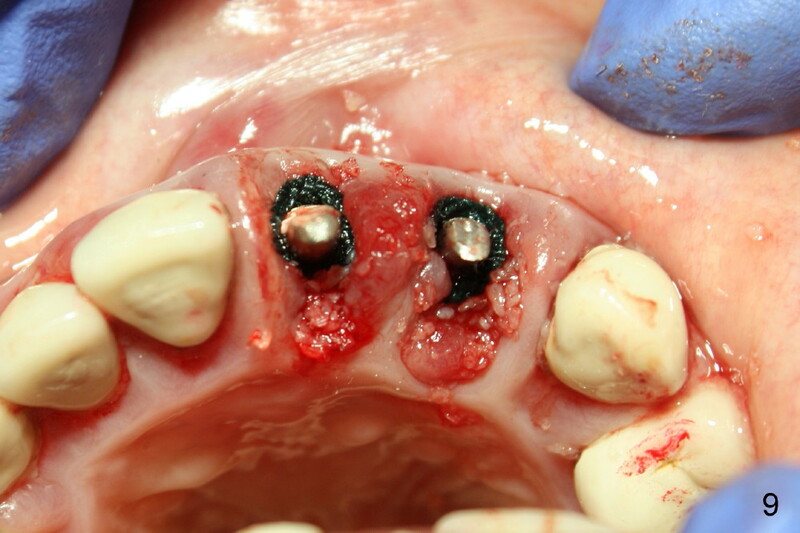 The papilla between the implants is collapsing (Fig.8,9). 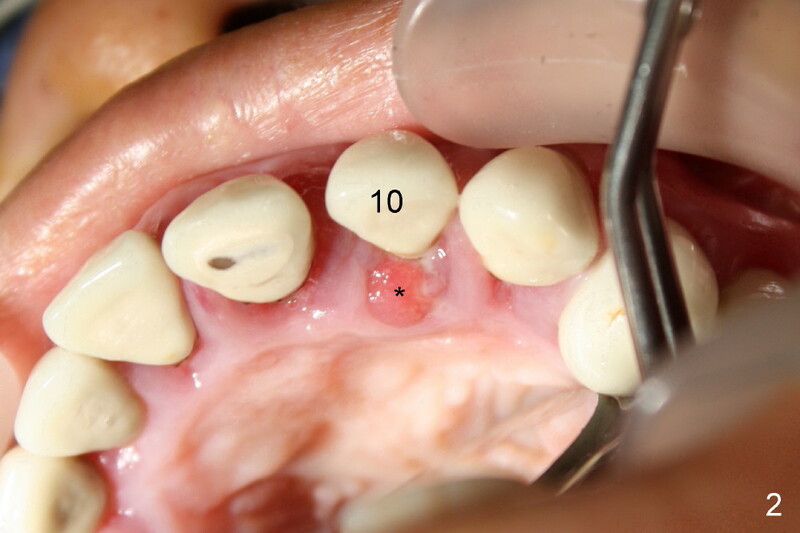 The interdental papillae are finally supported by the immediate provisionals (Fig.10,11). The patient returns for follow-up 8 days postop. 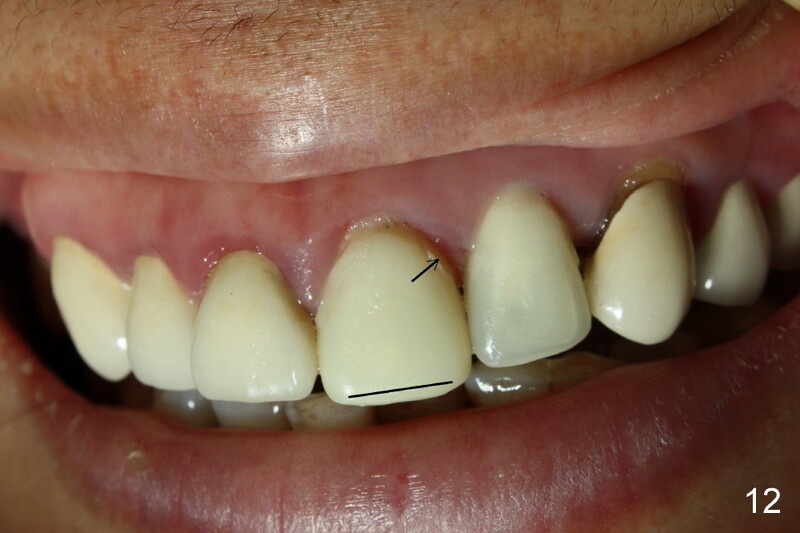 The gingiva looks healthy (Fig.12), particularly #10 lingual (Fig.13 >). 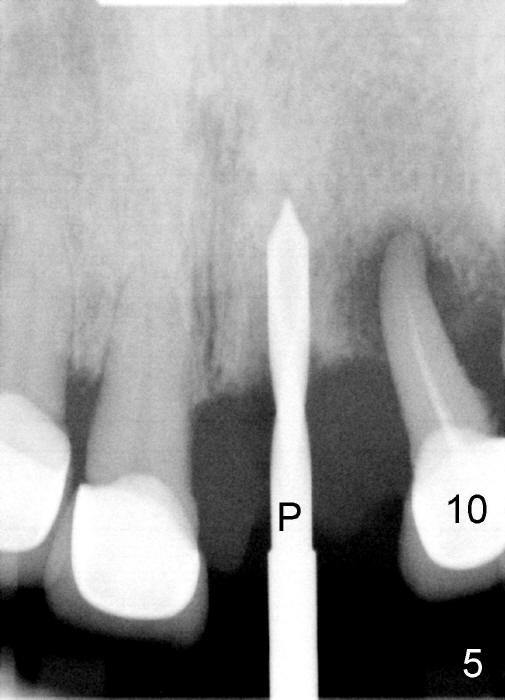 The immediate provisionals keep the papilla in place (Fig.12 >). 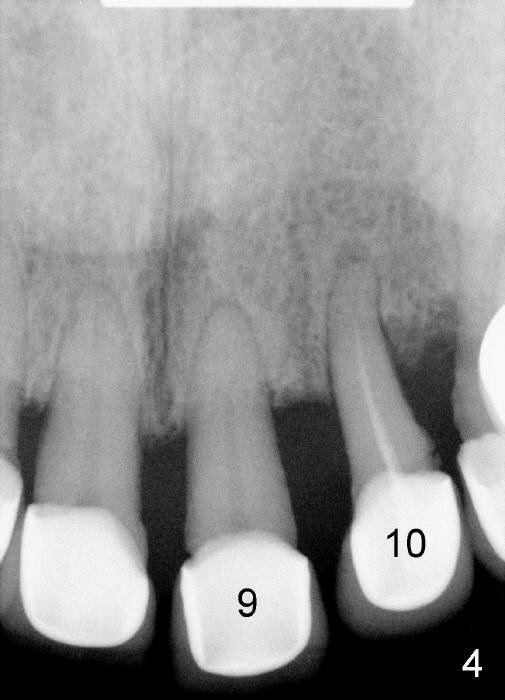 Since the provisional at the site of #9 is long (black line), it is removed for trimming (Fig.14); the papilla collapses mesially immediately (<-). 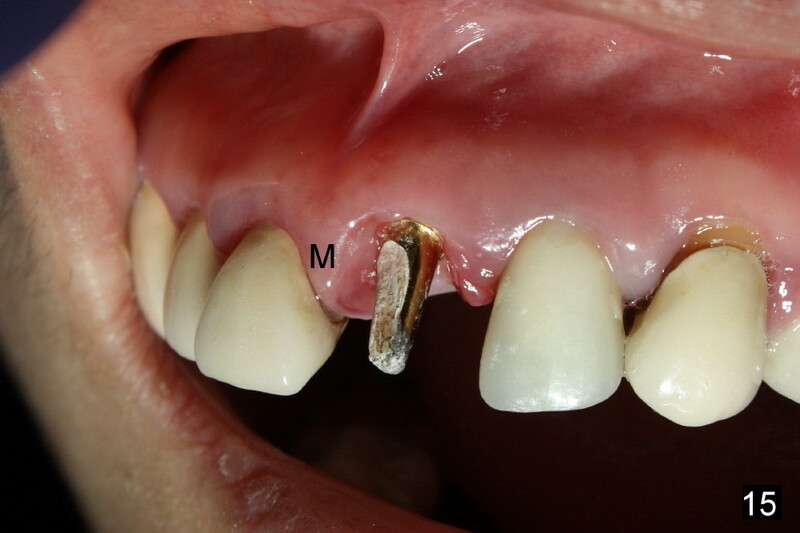 Probably it has more inflammation than its mesial counterpart (Fig.15 M). 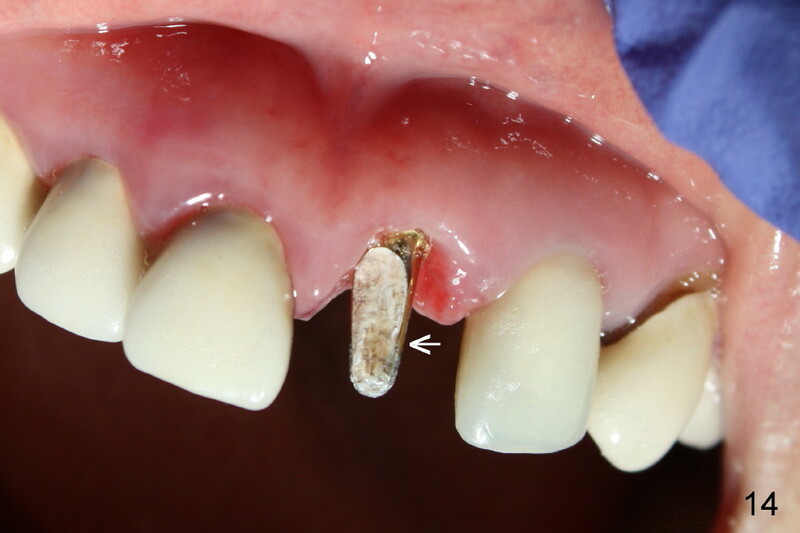 The partially displaced papilla returns to its normal position and shape (knife-edged, triangular) once one of the provisionals is recemented after being modified (Fig.16); the immediate provisionals play an important roll in papilla support (arrowheads). 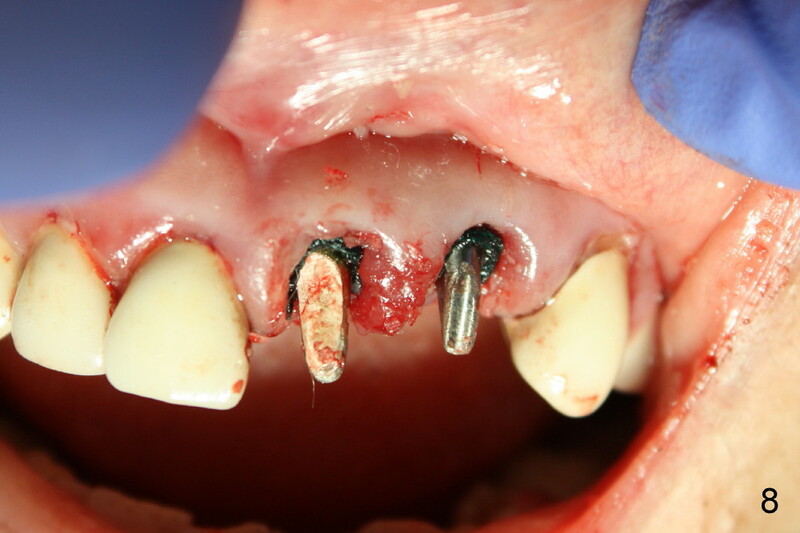 In summary, the gingival inflammation resolves once the infection source (affected teeth) is removed, its morphology is supported by implant-retained provisionals. 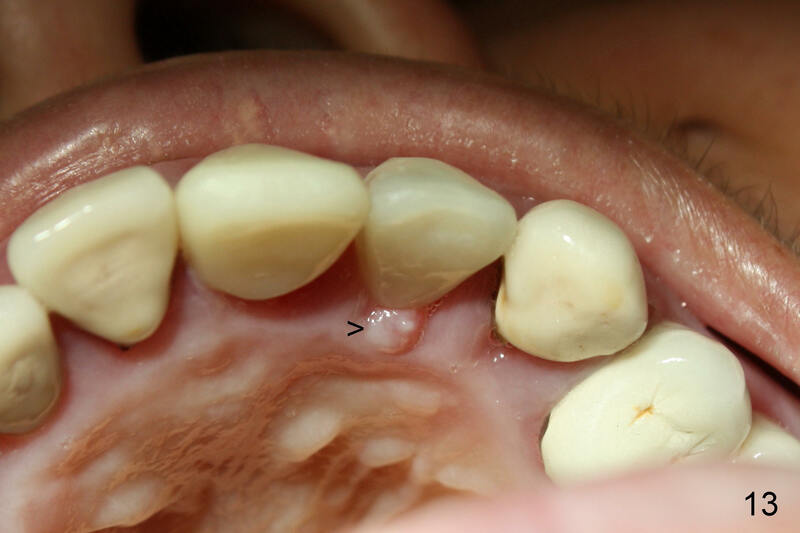 However gingival recession occurs postop. 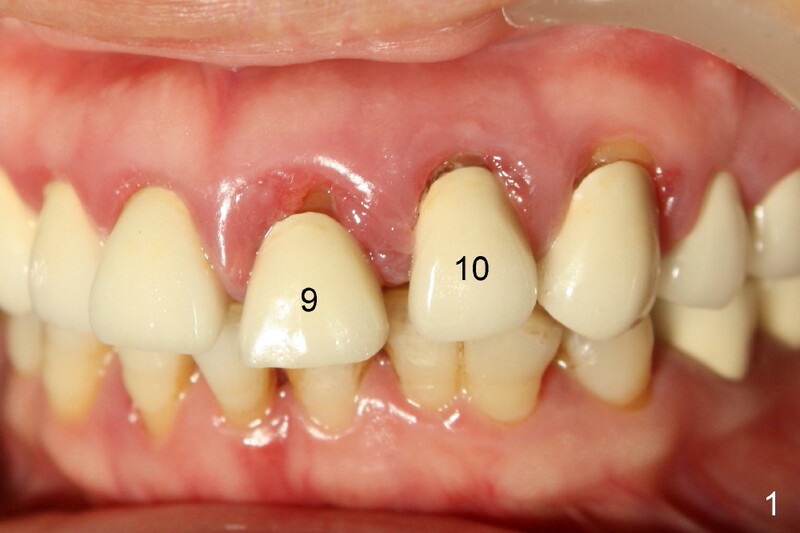 Three years post cementation when the implant at #8 osteointegrates, the crowns at #9 and 10 are removed. 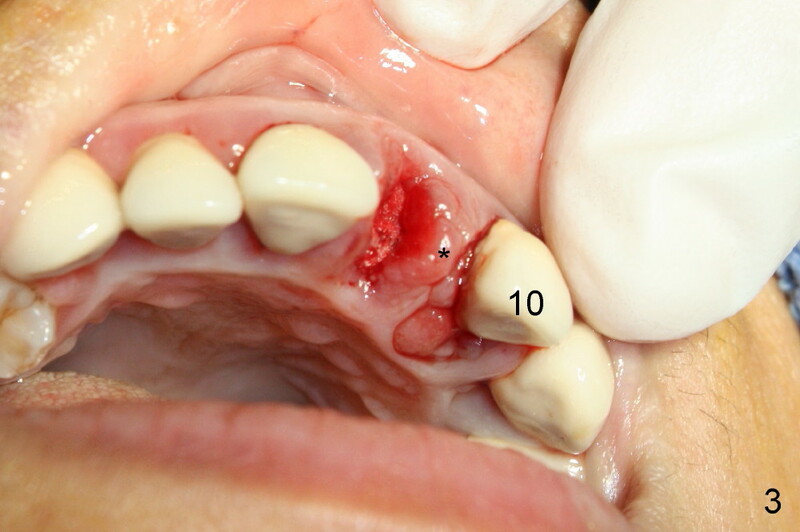 Periimplantitis appears at #10.